When you’re away from home and you see that a tire is a bit low on air (or your TPMS sensor let’s you know), having a good 12 volt air compressor in your vehicle sure is handy. A regular air compressor for home use won’t do you much good as far as portability is concerned. The best 12v air compressor will be lightweight, small, and portable and can really be a life saver. It can plug directly into the accessory port (cigarette lighter socket) of your car or truck or directly to your car’s battery and inflate the tire to get you back on the road again. You’ll want to make sure that your car furnishes enough amperage (which isn’t an issue for most vehicles), and that the tips for the compressor will fit the tires you need to inflate. 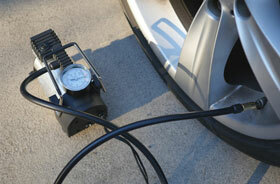 Keeping a good car tire inflator on hand is something that should be important to everyone. This is the best 12-volt compressor on our list for light to medium inflation tasks. Unlike the competitors, the Viair 00073 provides up to 100psi working air pressure. Since it weighs in at only about 5 pounds, the 00073 is also small and light enough to store in your trunk or behind the seat of your truck for easy availability. It is rated for a 15amp accessory port, a standard item on newer cars but as common on older models. One of the features that sets it apart as leader of the pack is the extra long 15 foot power cord — more than 3 feet more reach than the closest competitor! The device is quieter than you might expect, thanks to more than 15 years of Viair specializing in personal and industrial air compressors. 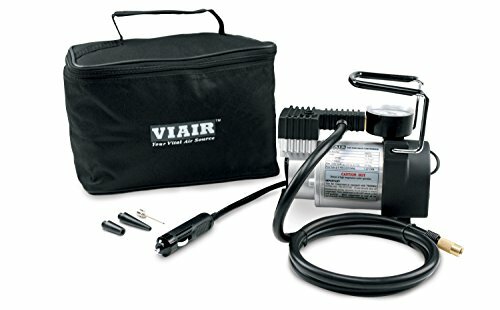 The Viair compressor only works on 12v DC current, which is fine for most users, but having an auxiliary AC power cord would be a nice addition for most of us. Something that is missing from the Viair air compressor is an automatic shut off to avoid overfilling. Another problem is that you will have to turn the compressor off in order to check the actual tire pressure, which can be annoying but does not really affect the operation. If you’re serious about getting an accurate reading, a good quality tire gauge is always preferred even if the unit has a built in gauge (which normally isn’t as accurate). The same issue also affects pneumatic tire inflators. 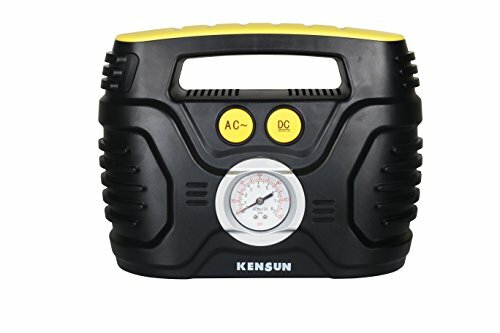 Kensun made the grade by building a highly rated 12v air compressor that uses both AC (standard outlet) and DC (cigarette lighter) current. Like Kensun’s older best-selling D1001 model, this model is super portable and perfect for inflating bike tires, small-medium pool toys, riding lawn mower tires, and most car tires. It has a 9 foot power cord, and comes with attachments that will allow you to inflate all the aforementioned items and more. The metal nozzle is also nice, but the plastic connectors will wear quickly unless you take good care of them. The built-in gauge is reasonably accurate, and even though the compressor is small, it has enough kick to inflate a car tire without jacking up the car. Great for light use but go with a heavier duty model such as the Viair above if you need a bit more power. Even though it is the smallest one on the list, the BellAire 3000 is one of the best 12v air compressors you are likely to find. The gauge will go as high as 150 psi, but the maximum output is closer to 65psi. It has an automatic shut-off to avoid overfilling, and the 10 foot power cord is sufficient for all but the biggest noncommercial vehicles. Unlike the competition, this unit will work on most vehicles, regardless of whether they provide 8 or 15 amp accessory amperage. The built-in gauge is not especially accurate, but it is consistent enough that once you know how much it is off you will always be able to get the desired pressure by compensating. 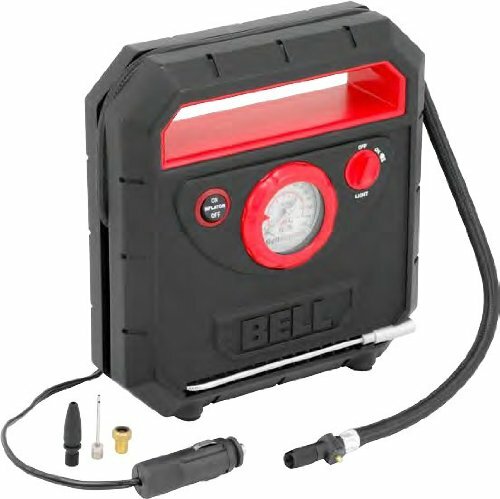 The Bell Tire Inflator is also not as well made as the Viair 70p, but it has some features, like the auto shut-off, that are lacking in our pick for the best 12v air compressor. Just stay away from the Audew (or however you spell it) compressor that “seems” to be so popular. Other sites keep promoting it but it’s junk. Any Viair is 10x better. Thanks RJ. All I can say is YEP. Will these inflate an air mattress for camping? Was planning on buying an inflator just for that but it sounds like i might be able to kill two birds with one stone. They most certainly will. You’ll need some type of nozzle adapter which all of these models have but you may want to check how big the opening is on your air mattress.